Rod Jetton, the former Missouri pol charged with assault after a November sexual encounter, is now reportedly under scrutiny in an FBI probe into the killing of a bill to regulate strip clubs. No question there’s interest in Rod Jetton,” former lawmaker Bob Johnson, who was interviewed by three agents, told the Star. “That’s all they wanted to talk about. Rumors of a federal probe have prompted lawmakers on both sides and the Governor to call for major ethics reform. Don’t you just love how everybody gets so reform-minded when somebody gets nailed for doing what everybody knew everybody else was doing all along? I’ll believe there’ll be reform when I see it – but meanwhile, karma couldn’t blow-back on a more deserving member of the fraternity of evil clowns that seems to want to congregate in Jefferson City. Yo Tony, False Equivalence is probably in the Stylebook, right? Wonder why it’s taken so long for a bill to grab any traction making it illegal for lawmakers to work as political consultants? Because former House Speaker Rod Jetton wasn’t the only one doing it. The Speaker of the Missouri House is the most powerful person in the Missouri House. The Minority Whip is probably near the bottom of the top 25 depending on how many permanent committees are in existence at this time. In other words, the Majority Whip is in the top 5 of power in the 163 member house most of the time. And I’d need to do more digging to decide on if the Democratic Whip is powerful enough to be near the top 20% of the Legislature in power and influence. That being said. Legislators still shouldn’t be paid political consultants and Reporters will unleash false equivalence beyond all reason. This changes nothing. Anonymous Republican state rep: "We need new leadership in the House"
Here’s some excerpts of interest from the letter (published on Prime Buzz) and it’s not complimentary towards the idea of Speaker “Air” Tilley. Our Missouri Republican House is full of hard-working, industrious legislators who are doing their best for Missouri. But our attempts to build a better and stronger party are being held back by the waste and greed of select individuals who have directed the party’s resources to advance their own agendas. It began with Rod Jetton, and continues today with Steve Tilley. Through their multiple political connections, Tilley and Jetton are inexorably connected. After Jetton left the HRCC, his leadership committee was given a jump-start of $15,922.00 by a PAC connected to Tilley. Tilley has directly employed Jetton’s consulting services, and their indirect relationships are too numerous to count here. Through them, Tilley has been linked to many of the same controversies that have embroiled Jetton. I am unable to sympathize with them. They took an institution designed to help Republican candidates and used it to promote themselves. The Missouri Republican Party does not need and cannot afford the type of leadership that hides from the public view and operates in the shadows. We need new leadership in the House. For a member of the Missouri House to stand up and demand this change is unusual, but given the circumstances I see no other choice. I certainly never imagined myself doing this, but now I find myself disappointed for not doing it sooner. We need to demand new leadership to retain our majority. Speaker Jetton was obviously corrupted by power. We are entrusted by the people to do what is right. As painful as it may be for some, we need to disavow Speaker Jetton and his associates. We are the party of values, not this disgusting behavior. We need to clean up our House before the Democrats attack us and take the majority. 1) How did Kraske and/or Prime Buzz get this letter? through a sender or one of the recipients who leaked it quickly to the media? and unless the Rep created a new e-mail account for the occasion, they know who he is and it’s only a matter of time, really. 2) Is the leaking of this letter to Prime Buzz a reason to suspect that a Western MO rep sent this letter? or is Prime Buzz just quicker than the Political Fix? 3) As for disavowing. Former Jetton clients have taken the grueling step of saying they’d never hire a company that no longer exists (Jetton & Associates) or that they’d never hire them when they’re probably never running for office again (Rob Mayer, who saw around $80K disappear into Jetton’s hands). That’ll be enough to quite a few of them. 4) The one thing worse than wrongdoing amongst the Republican political establishment is pointing out wrongdoing. So I’d be surprised if this letter causes them to change their ways. The true believers really believe that they’re the party of values, no matter how many scandals they’re involved in, and that they don’t need to change. And when you think about it, perhaps we can say that the State of Missouri does not need and cannot afford the type of General Assembly leadership that hides from the public view and operates in the shadows. Thanks for the inspiration, anonymous Republican. We wish you the best in moving that giant boulder by yourself. Of course the client list is exaggerated, J&A was trying to get more money. And the story is on Talking Points Memo. Update 3: And Rod Jetton will be closing down his political consulting business in order “to deal with false allegations and spend time with his family” (his lawyers words). Not a stunner. Update 2: Rod Jetton’s mug shot suggests that there were no combs in the Cole County Sheriff’s office last night. And that Rod didn’t pay Tom DeLay for consulting on how to look for a mugshot. Update 1: RodJetton.org has gone offline, and a link to the Google cache of that page has been posted to replace that link in this post. Former Representative Jetton is innocent until proven guilty. But realistically, his public influence amongst Jeff City Republicans is gonna vaporize. The Republican General Assembly may be arrogant and overconfident, but they’re not that stupid. It’s for the purposes of posterity and public knowledge that the Representatives who have paid Jetton & Associates in the year 2009 (and what they paid for) are displayed for you, the reader, and their constituents to know. 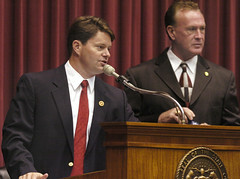 Will the guy who could be the next Speaker of the Missouri House continue his hand-in-hand relationship with Jetton & Associates in the year 2010? You don’t need a political consultant to figure out the answer to that question. It’ll be around a month from now before we figure out the 4th quarter spending from candidates to J&A. Will Floor Leader Tilley (R-da plane da plane) top $50K in payments to Jetton in 2009? Can’t wait to see. "The Sad Legacy of the Jetton Era"
Term limits do more harm than good, but they are not without virtue. For example: Rod Jetton is history. The Sunday Post-Dispatch has a double-wide editorial about “The Sad Legacy of the Jetton Era,” as good a summary of his depradations as you’ll find. It gets five stars. Perhaps the greatest irony of Mr. Jetton’s last days in the Legislature was that work on voter ID, as well as work on such causes as abortion restrictions and illegal immigration, was held up by a Jetton sweetheart deal that even his GOP colleagues hated. A year ago, Mr. Jetton had engineered a stealth amendment to an economic development bill that benefited developer Robert W. Plaster of Lebanon, a major campaign contributor and hunting buddy of the speaker’s. The amendment allowed a single person – in this case, Mr. Plaster – to incorporate land near Table Rock Lake as a “village,” thus bypassing local officials in Stone County. Other developers began trying to take advantage of the “village law,” causing local officials around the state to complain to their legislators. Their effort to repeal the village law caused a logjam and filibusters during the last week of the legislative session. Mr. Jetton finally relented at 4 o’clock Friday morning, but only after cutting a deal that gives Mr. Plaster more time to set up his village. By then, even some of his fellow Republicans were sick of him. Still, by dragging his feet Rod Jetton may inadvertently have saved the people of Missouri from several other lousy laws. It’s not much of a legacy for the star of the Class of 2000, but it’s all there is. Mitt Romney, the son of Michigan governor George W. Romney, is beloved among Republican elites here in Missouri. Matt Blunt and Jim Talent both endorsed him fairly early. Jack Jackson, Jason Crowell, Gary Nodler, Bryan Pratt, Shannon Cooper, David Day, Doug Funderbunk, Dwight Scharnhorst, Neal St. Onge, and Bryan Stevenson have all endorsed him, too. And in a recent e-mail, Rod Jetton (h/t Arch City Chronicle) details how he was won over at a meeting with Mitt, just like “when you go to those time-share presentations.” (That’s a direct quote – I kid you not.) Ed Martin was won over with the answer to the first question of the meeting – his own – which was about the Iraq war abortion universal health care global warming Romney’s Mormon faith, of course. Romney has a record of moderate governance, working to balance budgets, preserve a woman’s right to choose, extend health care to every citizen. Of course, that gives him no chance in the Republican presidential primary, so now he’s running as the most conservative candidate in the race. Double Guantanamo! Slash taxes! No universal health care! Stay the course in Iraq! In honor of his whiplash-inducing position changes, the Democratic National Committee is auctioning off a ‘Mitt Romney Flip Flop Kit” on eBay. Details below the flip. The Democratic National Committee is auctioning off a special edition Mitt Romney Flip-Flop Kit. Having apparently run out of policy positions to auction off this campaign season, Republican presidential candidate Mitt Romney is now calling on his supporters to join him in selling off parts of their pasts too. Sure, smooth talking Mitt Romney is reportedly planning to spend as much as $60 million of his own money to win the GOP nomination. But his campaign is still looking to reverse its declining fundraising numbers by convincing supporters to auction off old belongings and give the proceeds to the campaign. Flip-Flop flash cards in the shape of flip-flops so you can study on all of Mitt Romney’s various positions, courtesy of the Massachusetts Democratic Party. A collection of Democratic signs, posters, pins and collectibles. Special note-our lawyers are making us say this-the winning bid is a contribution to the Democratic National Committee and is subject to the restrictions and limitations of federal campaign finance laws. The DNC will make a contribution equal to the amount of the winning bid to a local animal shelter. Contributions are not deductible as charitable contributions for federal income tax purposes. Paid for and authorized by the Democratic National Committee. This communication is not authorized by any candidate or candidate’s committee.